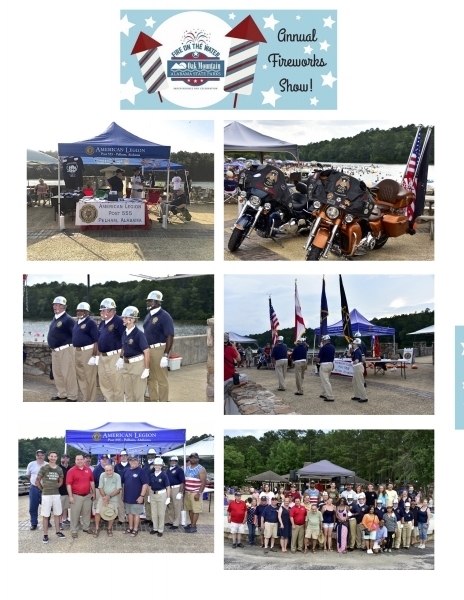 Approximately 40 Post 555 members and family members attended July 1st Fire on the Water; Independence Day Celebration. Including the AL Department Adjutant Greg Akers, his wife, and kids. The displayed Legion material and donated Legion pamphlets, pins, and bags to the Post. o Five Post 555 members presented (not post) the National Colors, State Flag, Legion Flag, and POW Flag during the singing of the National Anthem. § This was a change to the initial plan of presenting the National Colors and Legion Flag. 7:15 pm: Took a group Legion family photo after the presentation of the Colors. Mr. Robinson’s wife, and four kids accompanied him. Hope to include the singer entire family in next year’s group photo. The singer used his iPhone 5 with a 1/8” earbud port during the musical tribute.